A problem often experienced when stealing the top card of the deck into rear palm is that of positioning the right hand to receive the card without assuming an unnatural forward hand posture over the pack. 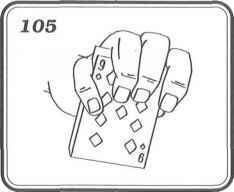 Here is a solution in which the palm is executed during the action of pushing another card into the pack. The psychology is borrowed from Edward Mario's misdirection palm in which a card is stolen into classic palm (ref. The Cardician, pp. 55-57). The card you wish to palm must first be controlled to a position second from the top of the pack. Then, while holding the deck in left-hand dealing position, form a fourth-finger break below the top two cards. With your right hand, remove the top card and display it. Motivation for this action must be derived from the trick being performed. For instance, you might be showing that the top card is not a spectator's selection, or you might be pretending to believe that this card is the chosen one. After the card has been exhibited, insert it into the center of the pack and leave it protruding from the front for about three-quarters of its length. Momentarily move the right hand away from the pack to display the outjogged card. Then bring the hand back over the deck, until the right fingertips can contact the outer end of the card to push it flush. The right thumb should lie relaxed at the side of the hand. Now, in the initial action of pushing the protruding card square, lower the right hand momentarily, bringing it near the top of the pack. The instant the right hand assumes this position, use your left fourth finger to lift the Lop card. Then introduce the tips of the left second and third fingers into the widened break, and press the card up against Lhe righL palm. 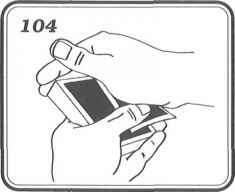 AL the same time, press downward with the right edge of the right palm, levering the card up and into Lhe hand (Figure 102, right hand tilted to expose Lhe maneuver). The insLanL the card is pressed securely to the palm, the right hand rises away from the deck, resuming its former position. Do not at this point try to rear palm the card. Instead, continue to use the left fingertips to press the card upward against the palm. Also, as the cards are raised into place, make a slight leftward body turn, Lo guard against the vulnerable left angle. By this time, the right fingers should be pushing the outjogged card flush with the pack. As an aid to this action, move the right thumb to the inner left corner of the deck. card if necessary. 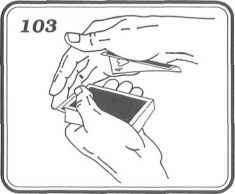 In fact, the actual palming of the card can be delayed for a few seconds more while the deck is squared, by allowing the card to skate over the nails of the left fingers before pressing it into the palm. Conclude by moving the right hand away from the deck, clasping the card in rear palm. It should be noted that this procedure can also be used to rear palm more than one card. Simply form a break under the cards you wish to palm from the deck, and proceed as above. Once the card is in rear palm, it is often necessary to replace it secretly on the deck. 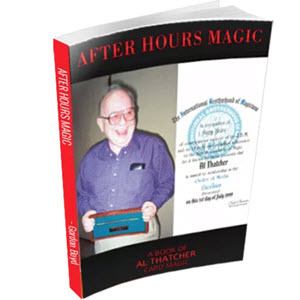 Methods for accomplishing this can be found in Expert Card Technique (p, 140) and in Ganson's Farther Inner Secrets of Card Magic (p. 46). Here is an approach of Mr. Elmsley's that is quick, smooth and indetectable. Hold the face-down deck in left-hand dealing grip, but positioned farther forward and a bit more to the right than is usual. The front end of the pack should project beyond the forefinger. You can, if you like, set the left fourth finger at the inner end of the deck, near the right corner. Bring the right hand to the deck from a position to the right and slightly forward of it. 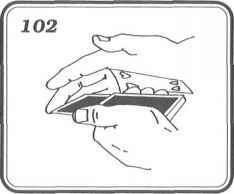 As the right hand sweeps in over the pack from the outer right corner, raise the left thumb slightly from the back of the deck to allow the inner left comer of the rear-palmed card to pass under it (Figure 104). around the front end (Figure 105). Then remove the deck from the left hand and tap its inner end on the table, in a squaring action, In this way the replacement is executed invisibly without a hint of hesitation.